All gardens need some wind to circulate the air. Winds that are too strong though can do severe damage to a garden. One of the main dangers of wind on plants is the loss of water to the leaves. Plants normally get water from the soil and it slowly moves up through the plant. Strong winds dry out the leaves and the water cannot get to them fast enough. Constant wind coming from one direction can cause plants to grow lop-sided or can stunt a plants growth. 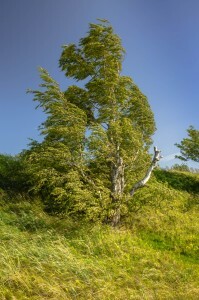 Wind can break off leaves and branches further damaging plants. Another thing to consider is that winds make the temperature colder than it actually is on a thermometer. This can make conditions unbearable for sensitive plants. Often when planning a new landscaping project we will make considerations for high winds, this can be evident in the layout of your garden and positioning of plants. Our garden design services consider all weather conditions and can also include regular maintenance packages to ensure that your landscaping is always ready for any type of coming weather. Below are a few tips for keeping your garden safe during high winds. Position your garden along a south wall on your property. A south wall will protect against heavy north winds. It will also absorb daytime sunlight and slowly releases heat during the night. Use fences with slates to help break the force of the winds, while still allowing air to circulate. Consider using a shelter belt. 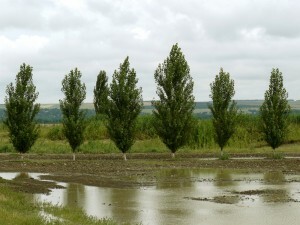 (Row of trees or shrubs that will break the force of the wind). A shelter belt of trees should be perpendicular to the prevailing winds. In most locations, this would be along the north and west borders of the garden. Use row cover fabric to cover more sensitive plants. Cut a piece or row cover fabric to fit the plant and cover it when needed. Do this to all the plants that need it. Be sure to use row covers that are called frost blankets. They weigh 1.5 ounces per square yard. They are the ones that offer frost protection down to 8 degrees Fahrenheit. Use these no matter what the temperature because they are strong enough to protect plants from strong winds. If you are not prepared for strong winds, and you have to take quick action, you can temporarily use laundry baskets or rubbish bins to place over the top of plants that are most likely to be damaged with strong winds. You will need to find something to hold them in place until the winds die down. When the winds do die down, do some pre-planning and use one or more of the suggestions mentioned above, so that you will be prepared for strong winds the next time they swoop in.